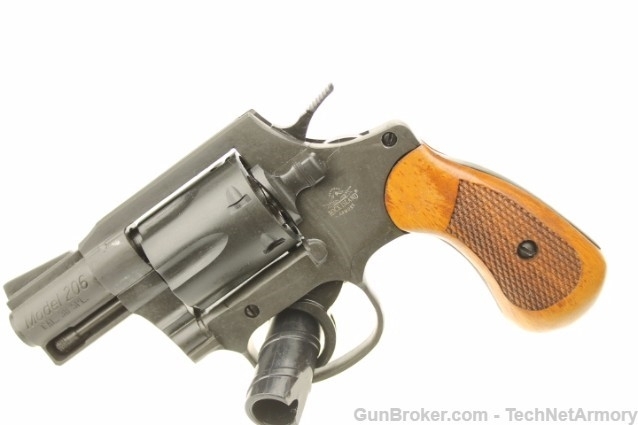 The M206 Revolver is ideal for self defense and concealed carry. With a 2" fully shrouded barrel and spurless hammer along with a fixed front sight with smooth channel frame-cut rear sight, it's designed to perform when it counts. Chambered in 38 Special, this firearm comes equipped with a checkered wood grip and a parkerized finish. Ruger Vaquero .45ACP Blue 5154 S+W Model 629 6" Stainless 163606 Ruger Single Six Convertible 5.5" .22LR/WMR 0629 S+W 686 Plus 164198 .357M .38S&W 6"